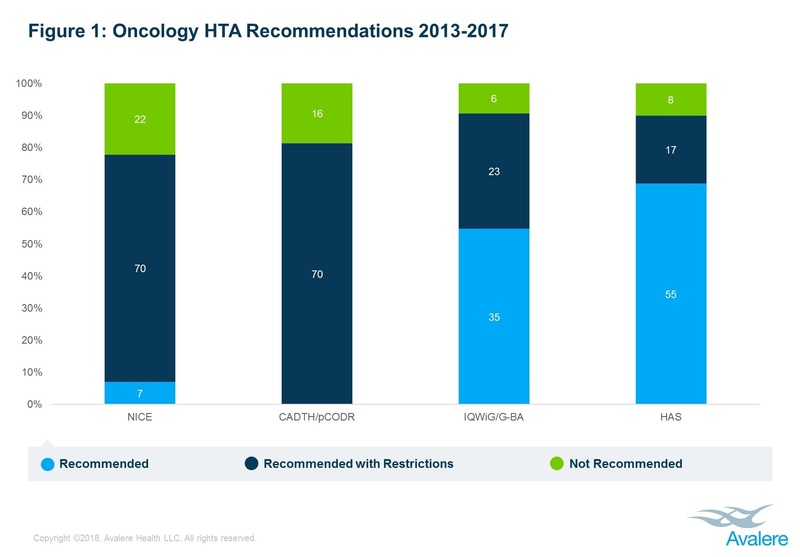 Of the 329 oncology HTAs analyzed from the period 2013–2017, 29% resulted in positive recommendations without restrictions. Avalere found that HTA reports are increasingly including caveats in access such as previous therapy treatment or time limits for reimbursement, all of which Avalere has defined as “recommended with restrictions.” In particular, these restrictions are frequently being tied to overall treatment cost or recommendations to restrict coverage to specific patient subpopulations. 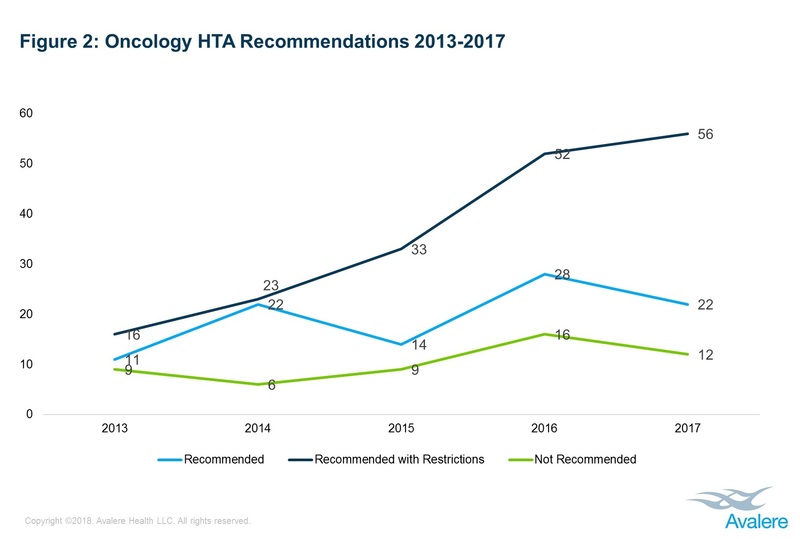 The percent of reviewed HTAs that received recommendations with restrictions increased to 62% in 2017 from 44% in 2013 (Figure 2). This rise in recommendations with restrictions parallels the rise in highly targeted, high price therapies. Avalere examined oncology HTA reports from the 4 HTA bodies published between January 2013 through December 2107. Oncology was defined as products that directly treat cancer or are primarily used in cancer supportive care. Products that treat oncology-related conditions were not assessed. Only draft and final reports were analyzed. For draft reports that were finalized within this time frame, Avalere only examined the most recent report. Conclusions were defined as “Recommended” if explicitly stated or if the product was found to be equivalent to or have improvement/benefit over comparators; “Recommended with Restrictions” if there were limitations placed on access; and “Not Recommended” if explicitly stated or if the product was found to have lesser/insufficient benefit versus comparators. A more detailed discussion of the methodology can be found in the full report. To learn more about Avalere’s work, connect with us.